Poëzie at the table: a pad with no less than 20 placemats and as many poems in Dutch of several Dutch poets including Kees Buddingh' K. Schippers, Annie M. G. Schmidt and Lévi Weemoedt. Useful and inspiring. Light grey with black printing, made of sturdy 400 grams cardboard and therefore several times to use. 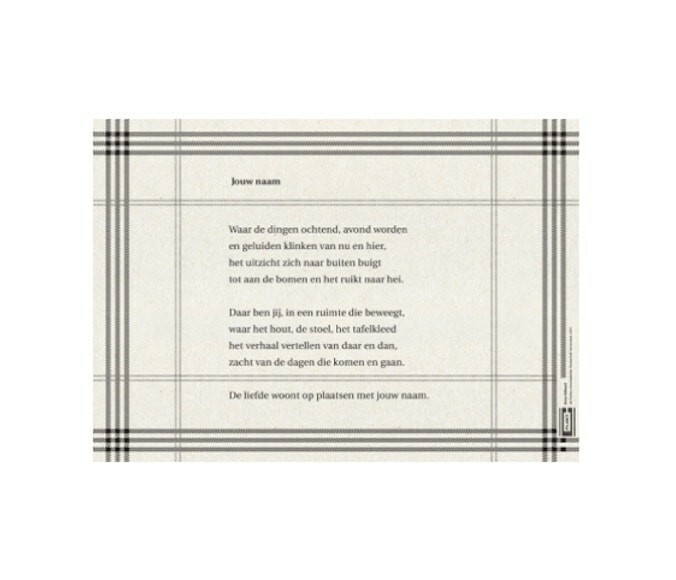 This placemat pad contains 20 placemats with just as many different poems of Dutch poets. Some poems are perfect to start the day, other poems fall better in place in the evening. But they are without exception a hook for your thoughts or a good conversation. 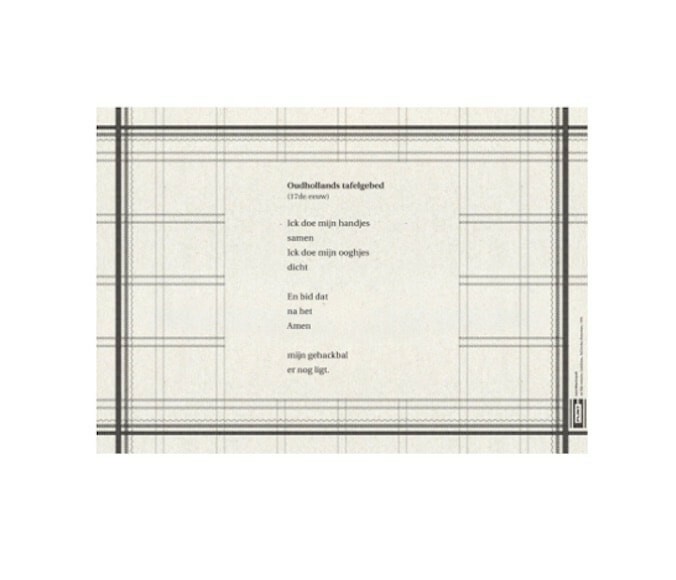 The placemat poems by the following Dutch poets: Maria Barnas, Kees Buddingh’, Simon van der Geest, Kees Hermis, Gil van der Heyden, Willem Hussem, Roland Jooris, Joke van Leeuwen, A. Marja, Loes Marijnissen, Hanny Michaelis, Leonard Nolens, Kreek Daey Ouwens, Fetze Pijlman, Bert Schierbeek, K. Schippers, Annie M. G. Schmidt, André Sollie, Anne Vollaard and Lévi Weemoedt. These placemats are very useful for a fine breakfast, a sandwich in between or when you want a fast table cover. With these placemats, you cover the table cheerfully in an instant! The placemats are light grey with black print and are made of 400 grams thick cardboard and therefore several times to use. Tip: when you plasticize your poetry placemats at a copy shop, they last far longer :-). The Dutch culture is rich in poetry. Plinth wants to get a large audience in touch with poetry and visual art, in all sorts of ways and moments. And especially with daily things that make your day just a little more fun, like these poetry placemats. 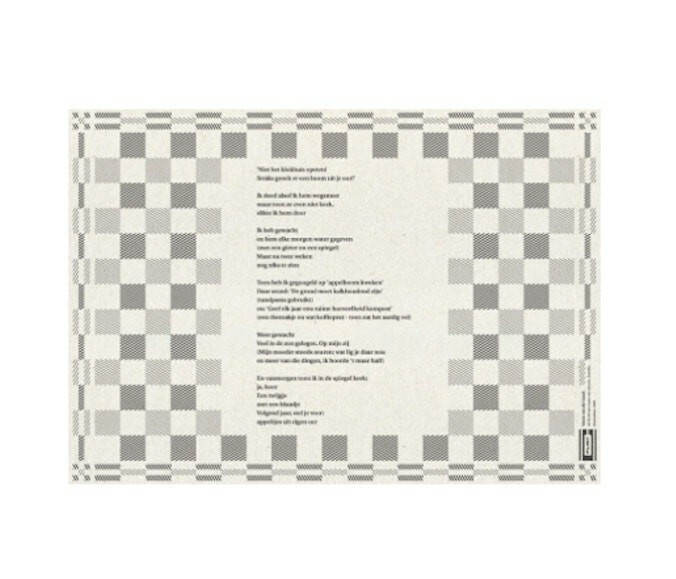 This block contains 20 poetry placemats with different poems. Nice to tear and set the table with different poems. If they are clean you can reuse them of course. Dirty placemats can be folded and thrown away with the old papers.